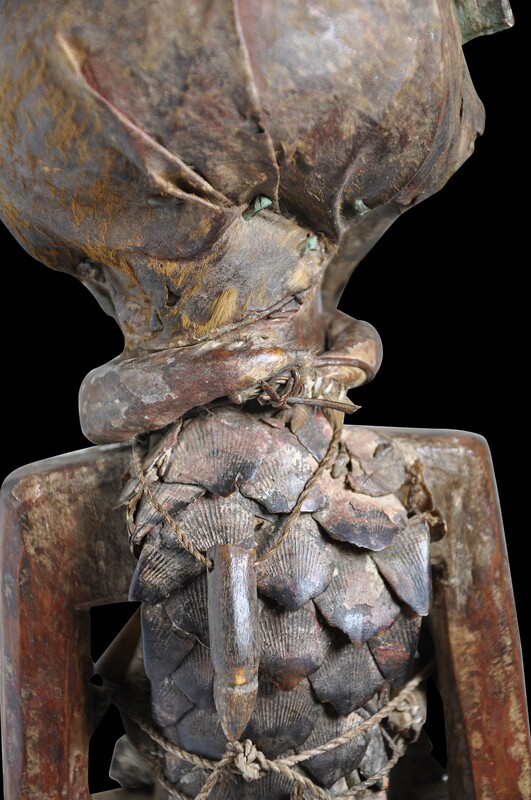 Such figures were used by the Songye people of the Congo as protective devices to ward off enemies from individual households and villages, and to bring fertility and wealth. Such statues were seen as being imbued with magical energy and were used only by village sharmans. Larger images were to protect whole villages. Smaller examples such as the example here were for individual use. The figure is carved with a typical ovoid head with a square, jutting jaw; a wide, opened mouth with under-hung lips; a sagittate-shaped nose; and large almond-shaped eyes, one of which is inset with a cowrie and the other being fully carved. The shoulders are square and the arms are elongated. Unusual carved folds fall from the neck beneath which a pair of breasts can be seen. The feet are long and over-sized and stand a rounded plinth; they are fully enunciated from the plinth and jut out beyond it. 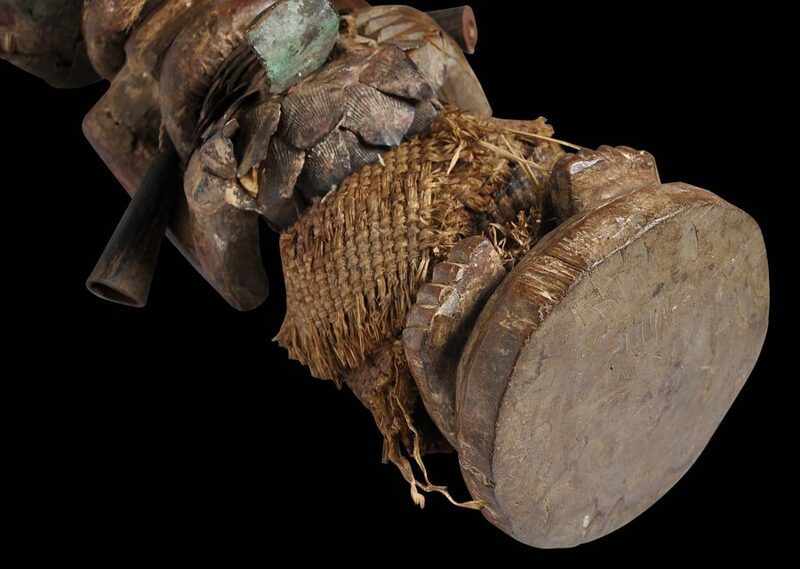 The head is decorated with bands of hammered copper sheet, tacks and metal plaques. The back of the head is tightly bound in animal hide or skin which seems to have had fur but this has now largely worn away. A smoothed reedbuck antelope horn with a superb reddish patina protrudes from the head. 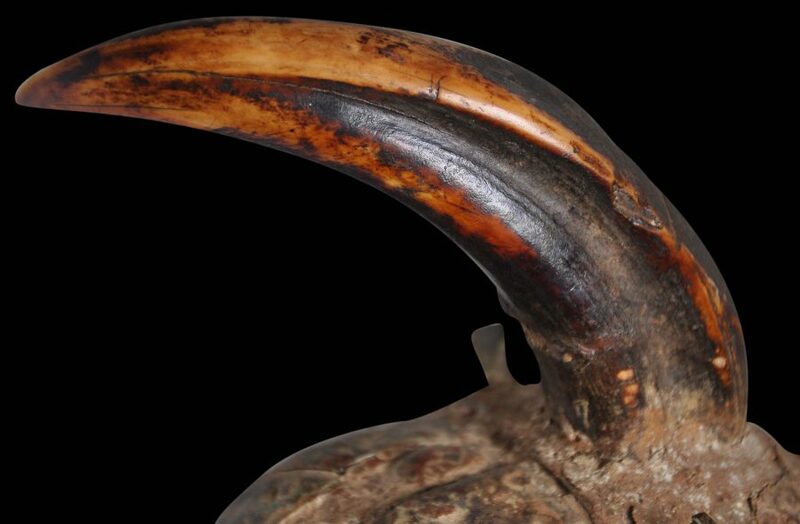 Typically, magical material was packed inside such horns before installation. A ring of stuffed hide encircles the neck and another encircles the upper abdomen. 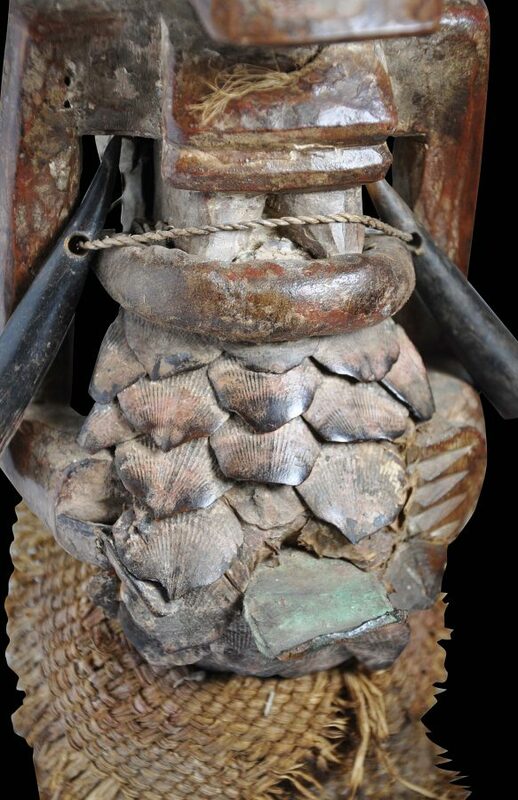 The chest and back are covered with pangolin skin and a prominent metal plaque protrudes from the umbilical area. Two Duiker antelope horns are suspended from around the upper chest and a small, single claw is suspended form the back. Each element of this figure has age, wear and varied patina. There is varying encrustation about the head and face. The pangolin scales have developed smoothness from handling. The metal used in the piece has developed varying wear and degradation. Overall, it is a fine example in good, stable condition. 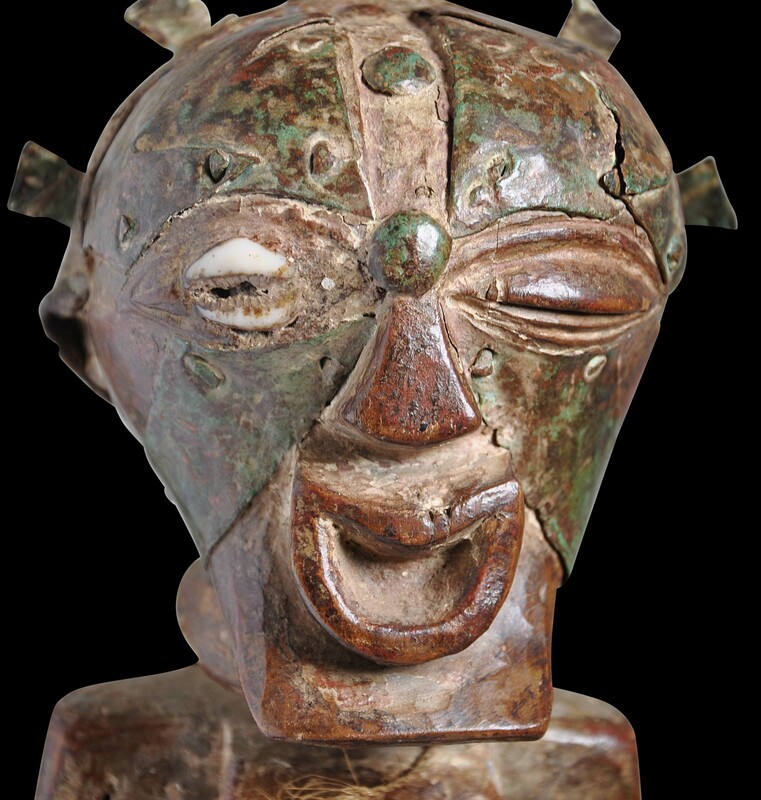 Celenko, T., A Treasury of African Art from the Harrison Eiteljorg Collection, Indiana University Press, 1983. Neyt, F., Songye, Prestel, 2009. 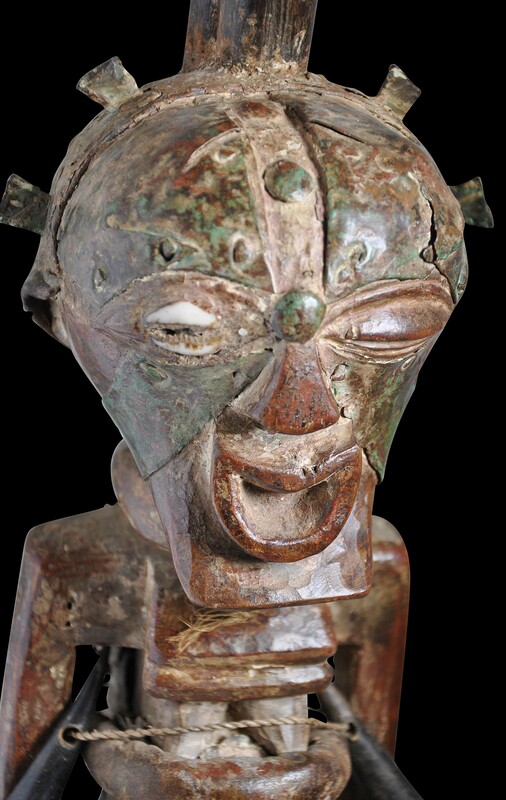 Petridis, C., et al., Fragments of the Invisible: The Rene and Odette Delenne Collection of Congo Sculpture, Cleveland Museum of Art/5 Continents, 2013.